Quality Meat Scotland (QMS) will next week launch a brand new ‘Go Places with Pork’ campaign to inspire and encourage Scottish consumers to try adventurous new pork dishes which are perfect for mid-week family meals. Launching on Monday 21 January, the six-week campaign features eight tantalising recipes which take consumers on a journey around the globe by showcasing dishes from Japan, Germany, Spain and Brazil, to name just a few. 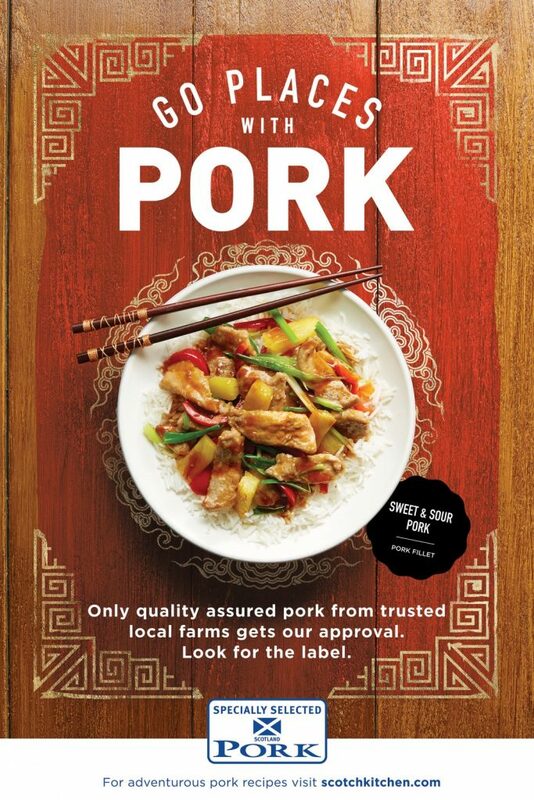 “The campaign messaging is supported by in-depth market research identifying our target audience and their existing perceptions of the Specially Selected Pork brand and pork in general. Public relations activity will be undertaken throughout the campaign period, including support from high profile chefs joining the call to get more Scots to consider pork as part of their plans to lead healthier lifestyles. Following on from the ‘Make it with Pork’ competition which was won by McCaskie Butchers in Wemyss Bay, over 200 Scotch Butchers Club members butchers will also receive point of sale kits featuring the ‘Go Places with Pork’ creatives and recipes to help them boost their sales of Specially Selected Pork. For delicious pork recipes and videos, please visit www.scotchkitchen.com or Scotch Kitchen on Facebook, Instagram or Twitter.